The Prince Gallery Tokyo Kioicho, a Luxury Collection Hotel promises unique traveling experiences in Chiyoda, a special ward in central Tokyo. The hotel is part of Tokyo Garden Terrace, a mixed-use development that comprises commercial, residential, retail, and entertainment spaces. The hotel is the perfect location to experience the metropolis's inspiring sites such as the nearby Imperial Palace. Deemed the jewel of the city, the Imperial Palace is surrounded by moats, stonewalls, bridges, and picturesque gardens. Complimentary fourth night for stays through March 31, 2017*. Restrictions may apply. Complimentary night will be adjusted at check-out. Japanese traditions and Western culture intertwine in Kioicho, a town distinguished by luscious greenery and a rich history. 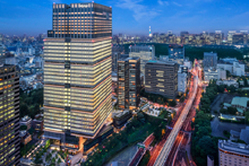 The Prince Gallery Tokyo Kioicho, a Luxury Collection Hotel is 10 minutes away by foot from the National Theatre of Japan, and a 30-minute walk from the Imperial Palace. Ideally located for both business and sightseeing, the hotel affords easy access to Narita International Airport (NRT) and Haneda Airport (HND), as well as major train stations. This sophisticated Kioicho hotel celebrates its cultural destination with top-floor panoramas and elegant design. In the two-story Sky Lobby, the impressive floor-to-ceiling window allows a kaleidoscope of colors as the city transforms throughout each day. A fully equipped fitness center, a rejuvenating spa, and epicurean restaurants beckon guests to linger. Business travelers will appreciate exquisite meeting facilities and knowledgeable service. Our 250 exquisite accommodations, including 11 suites, are customized to the needs of each guest via seamless, state-of-the-art services. Most rooms include a daybed near the window for outstanding views of this iconic metropolis. All accommodations feature plush bedding, bright lighting, and such modern technology as in-room tablets and complimentary wireless High Speed Internet Access.